The historic Paris Agreement on climate change sets the course for a fundamental transformation of the global economy over the next decades. The Agreement’s overarching goal of limiting global average temperature rise to “well below 2°C” will entail profound changes in the global energy system. Achieving the deep cuts in global carbon emissions that this vision requires is no small task given the enormous challenge of implementing – and eventually exceeding – current country climate pledges. 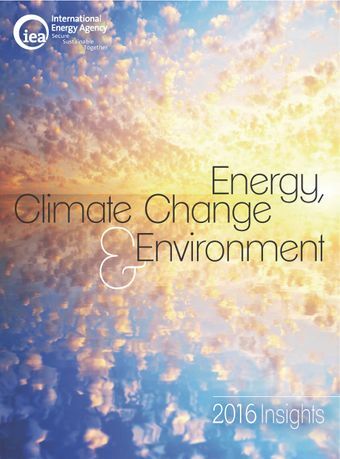 This publication examines key sectors, technologies, and policy measures that will be central in the transition to a lowcarbon energy system. It addresses the following questions:What are the roles of coal and gas in meeting the stringent decarbonisation requirements for the power sector consistent with IEA modelling of global climate goals?What are moderate carbon prices accomplishing in the electricity sector, and how can they be helpful as part of a package of other policies?Where are the opportunities for expanding renewables and energy efficiency, and what policies and regulatory frameworks are needed to boost these low-carbon energy sources?How can state-owned companies, which produce a large share of global GHG emissions but are also major developers of clean energy, be encouraged to play a more effective role in the energy transition?This report also looks at building climate resilience in the energy sector, and the use of tracking tools and metrics to monitor the progress of energy sector decarbonisation. Finally, it provides global energy and emissions data, including interregional comparisons and in-depth analysis for ten regions.